This is a general function, given points on a curve. 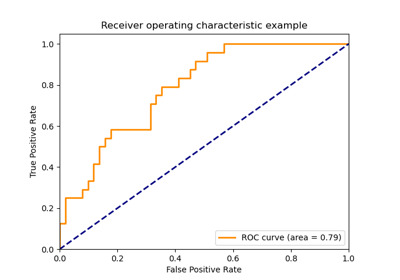 For computing the area under the ROC-curve, see roc_auc_score. 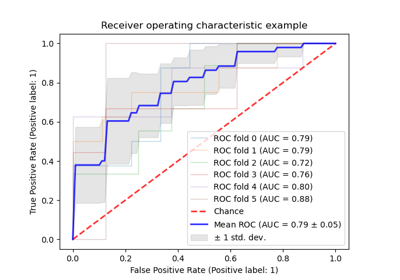 For an alternative way to summarize a precision-recall curve, see average_precision_score. x coordinates. These must be either monotonic increasing or monotonic decreasing. Whether to sort x before computing. If False, assume that x must be either monotonic increasing or monotonic decreasing. If True, y is used to break ties when sorting x. Make sure that y has a monotonic relation to x when setting reorder to True. Deprecated since version 0.20: Parameter reorder has been deprecated in version 0.20 and will be removed in 0.22. It’s introduced for roc_auc_score (not for general use) and is no longer used there. What’s more, the result from auc will be significantly influenced if x is sorted unexpectedly due to slight floating point error (See issue #9786). Future (and default) behavior is equivalent to reorder=False.